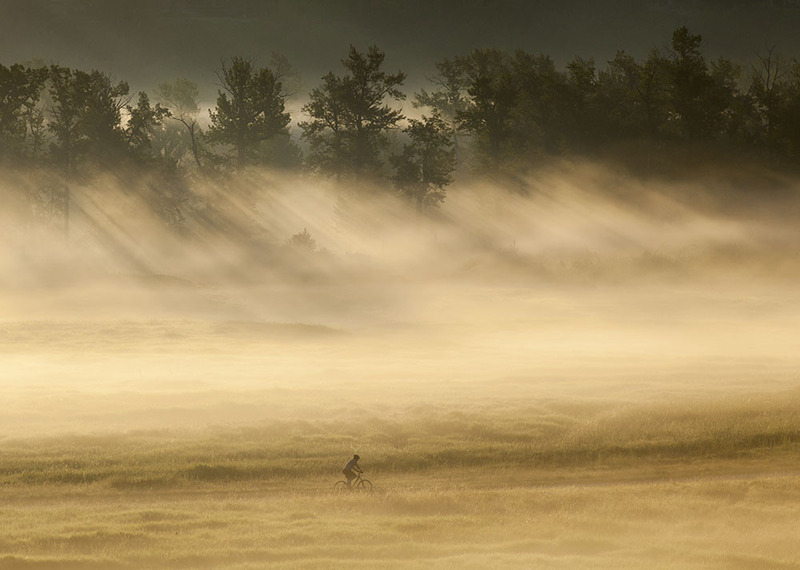 A cyclist rides through the early morning fog in Fish Creek Provincial Park, Calgary. The 5 a.m. wakeup call came courtesy of Roscoe, the always energetic Ring-necked pheasant who lives in front of our house. His nails-on-chalk-board squawk roused us to a pre-dawn scene of beauty unfolding before us. Fish Creek was full of fog and the rising sun would soon light the fog creating a muted scene of warm colours. I shot for over an hour from the ridge, occasionally returning to the deck for a sip of coffee. A lone cyclist, peddling on one of the many bicycle trails that criss-cross the valley gave the peaceful scene a sense of scale. The serenity of the fog-filled valley stands in stark contrast to the scenes of flooding and destruction from Calgary, Canmore, High River and other southern Alberta towns. A part of this old news photographer wanted to join in the coverage of this huge story. I covered the 2005 flooding in Pincher Creek and Drumheller and have witnessed more than my share of sorrow, pain and heartbreak in 35 years of news photography. This time I stayed home. The last thing the situation needed was another bystander with a camera recording the misfortune of others. When I was a member of the fourth estate I had a job to do by reporting on these stories. Now my job is to pitch in and help with the cleanup. I’ve spent four days – two in Calgary at the National Music Centre and two in High River – cleaning up and with more to come. It’s the least I can do. During the 2005 flood in Drumheller, I remember photographing a frantic situation where volunteers were making sand bags and loading them on a trailer. It was extremely tense. People’s homes were in danger of being destroyed by the rampaging Red Deer River. Somebody angrily hollered at me to put down my cameras and pitch in. That was not my job in that moment but the exchange stuck with me. Maybe now I’m able to make amends. It’s the least I can do. Grant, Love reading your posts. Was wondering if you were OK during the floods because I knew you lived along a waterway. Sounds like everything was fine for you. Happy to hear. As an unfortunate victim of the Harrow/Kingsville/Leamington tornado in 2010, I’m glad you resisted the urge to go out and take photos. While cleaning up the disaster that was our house and yard, I was amazed at the constant stream of sightseers driving by. The only reason they could even get through our street was due to neighbors and volunteers with heavy equipment that cleared the roadway specifically for emergency vehicles. To see so many gawkers out for a “Sunday” drive was incredibly irritating. Several people even jumped out of their cars, ran across our property, took pictures of our partially crushed house, and giggled their way back to their vehicles, satisfied with the great pics they got. To say we were stunned at the insensitivity would be an understatement. More refreshing was the handful of folks who travelled to the area just to offer assistance. We declined help because we knew there were so many more less fortunate that needed it more than us. I must say though that the few media (some of your former coworkers) that did stop and take photos and video were very respectful and painfully aware of their level of intrusion. However, more was definitely not better. It doesn’t feel good to be a circus attraction at one of the most vulnerable times of your life. All that said, I do understand the power of a great photo. As they say a picture is worth a thousand words. As an enthusiastic amateur photographer I realize that there is sometimes no better way to tell a story than an incredible picture. Can’t imagine how hard it is to be the guy/girl with a camera at those historic moments in time whether good or (especially) bad. You’re never really welcome but it is one of those necessary components of a great story. Good read, Grant. An interesting thing about this flood coverage, I didn’t actually see all that many ‘citizen journalists’ out there getting in the way of the working professionals. This event seemed to tug at people’s need to help so much that most people put their smartphone cameras away to just roll up their sleeves to help. It was unique in that way, at least from my perspective. While covering the flood, I frequently felt the usual unavoidable guilt while photographing scenes that could have benefitted from having an extra helping hand instead of a camera. However, I was buoyed by the acceptance and openness of the people I was framing who just so badly wanted their stories to be told.